The term Fabric and Fabric Networking is used a lot these days by almost all vendors, the question is: What does that actually mean? 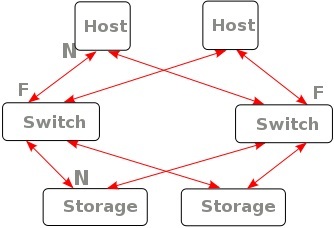 The industry came up with the term "Fabric" to describe networking technologies that allow networking gear (Switches and L3 Switches) to connect in a way to achieve a mesh topology. If you think of a real piece of cloth (fabric) the threads create a mesh. Mesh topology has always been identified as the ideal for resiliency; however, in the past, due to cost and protocol limitations this has been difficult, if not impossible to achieve. Traditional networking connectivity had only a few connections between devices. Resiliency typically meant two trunks, maybe three, especially in the WAN. Recent advancements in technology now permit intelligent switches to be hyper-connected and thus the term "Fabric" emerged to describe this new intelligent network. When you hear the term "Fabric" think more than "lots of links". This new fabric is intelligent and scalable. What does it mean to have an intelligent network? It means that the devices that comprise the network fabric are managed and seen as an integrated whole rather than a series of interconnected devices. The network administrator has the ability to define policies for any device, application, job classification, individual, etc. These policies can intersect and the fabric will automatically adjust to provide that object the level of service that the policies dictate. There is no longer a need to provision each switch and port whenever a new user, device, or application is added to the organization. An administrator will create the policy, provision the endpoints and the fabric will auto learn and provision itself to meet the requirements. This capability is enabled via new technologies and protocols that have been defined and ratified by the IEEE (Institute of Electrical and Electronics Engineers) and IETF (Internet Engineering Task Force). To achieve end to end fabric, the network will need to have intelligent devices capable of SPB (Shortest Path Bridging), and SDN (Software Defined Networks). TRILL ("Transparent Interconnection of Lots of Links") is another standard that was developed in an attempt to achieve full fabric networking. While it does meet some of the requirement for fabric, it is intended only for the core and does not reach to the edge so that the promise of full fabric and SDN can never be realized. Gail Caros is a Senior IT Sales Professional currently with Intelli-Flex, Inc., a national leader in unified communications, video conferencing, voice and data technologies, contact center, network security, and hosted (cloud) Voice Services. Gail has experience helping customers with selection, design, implementation and maintenance of large multi-national, multi-vendor IP and VoIP Contact Centers and the networks that support them. • Networking Protocols, Ports, Standards, and Organizations What Does it All Mean? • What Are Private IP Addresses?